I might try to post a quick how to next time on steps I did to recover my blog. I am sad on how foolish people can be. They hack websites just for the mere fun of it. I hope there are not much of broken links as I just reinstalled wordpress again. 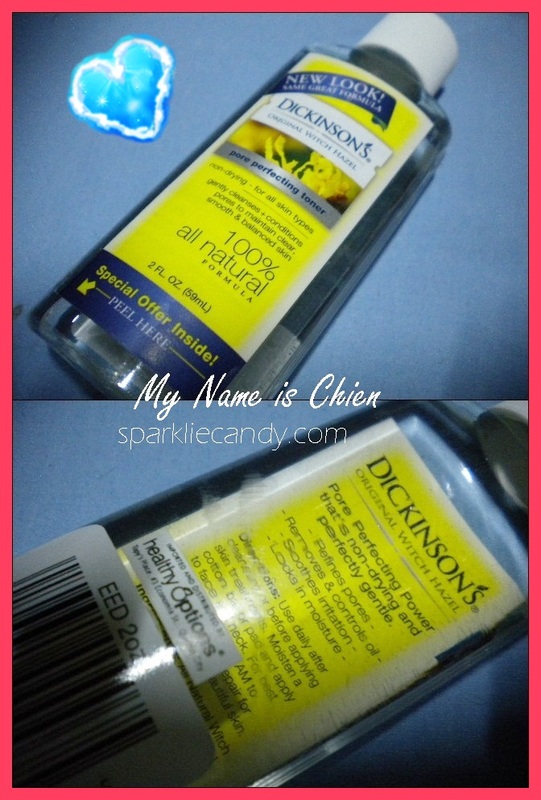 Anyway so since my blog is back online (although other pips can’t access it yet due to the warning page) I will post a review of my old favorite: Dickinson’s Original Witch Hazel Pore Perfecting Toner. About 5-10 minutes facial massage of Pure Beauty Perfect Cleansing Liquid to remove all traces of make-up. Wash off the oil and dirt with Moisturizing Collagen Soap. With a cotton ball moistened with Dickinson’s Witch Hazel Toner I am sure that my face is squeaky clean. Did Dickinson’s Original Witch Hazel Pore Perfecting Toner stayed true to it’s promise? Refines pores -With continuous use it might work but do not expect drastic changes. I have enlarged pores so I can see whether a product does tighten pores or not. Hmm… is that a good thing? Lol. At least I’ll know if something is not working, haha. So as per my research, i can also be used for insect bites, chicken pox etc because it can soothe itchiness. Click here to learn 15 ways of using Witch Hazel. Removes and controls oil -Yes it does remove oiliness and keeps my skin’s moisture. Which is a good thing. I notice that I don’t need to frequently use blotting paper anymore. Soothes Irritation -When I first used Dickinson’s Witch Hazel toner my skin is irritated due to dryness. It indeed helped reduced itchiness. I also used Physiogel cream along with this toner. Healthy Options for P79/ 2 oz. bottle, very affordable. It’s their travel size,which is cute compared to it’s original size which is a really big bottle. Effectively cleans despite being non-drying. Refreshes my skin. So perfect for summer! Accessible product, any SM malls with Healthy Options. Sometimes I don’t like the smell. though it really depends on my mood. LOL.. The scent of this toner is like chesnuts. Yes, this is an HG material. I still look forward into trying out Hada Lobo but for now Dickinson’s Witch Hazel toner is enough. I am more than loving this product, I might get the astringent version of this too, Soooo excited! I'm thinking of trying this since I want to find my HG toner. Thanks for sharing your thoughts. where to buy this product in manila area?